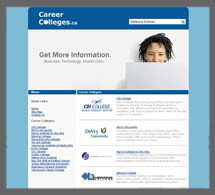 Profile your school on UC411.com, Canada's busiest education info-site. Be there when prospects compare their education choices everyday. Get aggressive with your internet marketing dollars. Great Exposure specializes in search engine optimization for schools across Canada. Let us design a Micro-Site to your specs on your own custom URL. Based on our decade of experience marketing schools online, your Micro-Site is created to be the most recruitment focused marketing tool possible. As a bonus, while live on our network, you are able to use this Micro-Site for any other marketing purpose you see fit. Click here to see samples! Just wanted to let you know that we have already received our first registration as a result of a lead from this years listing with Great Exposure Inc. (which only just took effect). This more than covers our cost for the entire year!